Cesiomaggiore, Heritage and Wilderness in the Dolomiti Bellunesi. Cesiomaggiore is a small town situated roughly half-way between Feltre and Belluno. 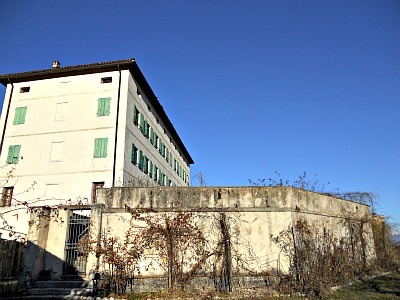 It hosts the headquarters of the Ethnographic Museum of the Province of Belluno, located in an open, panoramic location overlooking the Val Belluna; see image above. It can be reached from Feltre either through the more direct – but less interesting – National road, or with minor roads that follow the foothill of the mountains and which cross several small hamlets such as Umin, Villabruna and Castel Lusa, whose churches and castle, erected on elevated positions, testify a continuity of human settlement since the Iron Age (when those hillocks were first fortified – and then known as 'castellieri'). The church in Umin contains also the remains of an important Medieval fresco depicting the Last Supper. There are also, in Cesiomaggiore, some interesting examples of vernacular architecture, especially in the more outlying hamlets. The traditional house was built here mainly in stone, with balconies clad in wood running around the perimeter of the building (see an example in the image below). The "Via Claudia Augusta Altinate"
Cesiomaggiore is a centre of ancient origin, as witnessed by the via Claudia Augusta milestone discovered as far back as 1786. The Via Claudia Augusta Altinate is an ancient Roman imperial way that once connected Altino (near Venice – hence the name) to Augsburg (Augusta in Italian), in present-day Germany. This road was very important, as it was one of the main channels through which Latin culture spread into Central Europe. Apparently, the road was traced from 15 b.C. by Emperor Claudius, keen organizer of the Roman road system, and connected the Italian peninsula to the newly conquered Roman lands in the centre of Europe (then known as 'Noricum'); in fact, at the time, each victory at expanding the Empire was consolidated and sealed through the construction of roads. The Via Claudia Augusta was about 518 km long, and still to this day its route has not been completely established. It seems certain that one branch crossed the Feltre area towards the Valsugana (in Trentino); less clear is the section between Altino and Feltre, as well as the link branching off to Cadore. The only evident remains of the route are two milestones – one found in the vicinity of Merano/Meran (in South Tyrol) and the other right here, in Cesiomaggiore. As mentioned earlier, nowadays the town of Cesiomaggiore is worth a mention especially for the presence of a notable museum, the “Museo Etnografico della Provincia di Belluno” (Ethnographic Museum of the Province of Belluno) – a foremost institution of its kind. 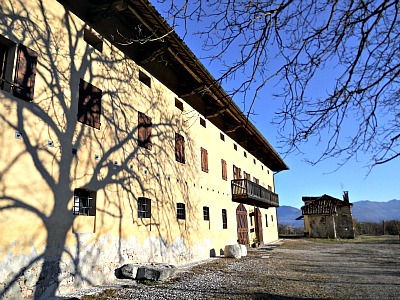 It is part of a network of Ethnographic Museums of which, in the Alps, is also to be mentioned the Trentino Ethnographic Museum (Museo degli Usi e Costumi della Gente Trentina). 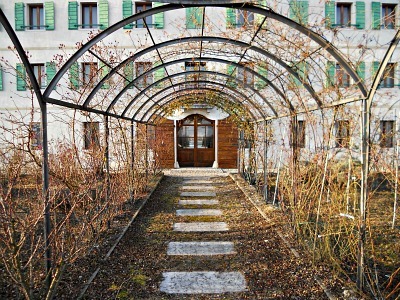 Recently rearranged in the noble setting of a 17th century villa (Villa Avogadro degli Azzoni; see image above), it is the most extensive and comprehensive collection of objects of ethnographic interest in the whole province of Belluno, and it functions as a coordinating hub for all activities related to ethnography and anthropology related to this section of the Dolomites. Appropriately themed, each set of rooms covers a topic which is highly relevant to the history of local cultural heritage: costumes, traditional objects, kitchen tools and working utensils, emigration, myths and tales, local language and music – plus an extensive section on agriculture, diet, and the difficult relationship between man and the mountains; particularly atmospheric is the reconstruction of an old kitchen. 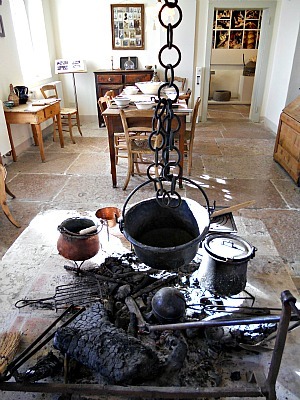 In addition, there is also a photographic and sound archive; the specialized library contains more than 5,000 volumes (in the picture below, see an image of the carefully reconstructed kitchen, with the stua – open fire – in the middle). A new section of the museum has recently been opened, focusing on the traditional uses of plants and herbs; it also displays notes on a recent project of reintroduction of old fruit tree cultivars (most notably apple and pear), carried out in association with the Park authority. 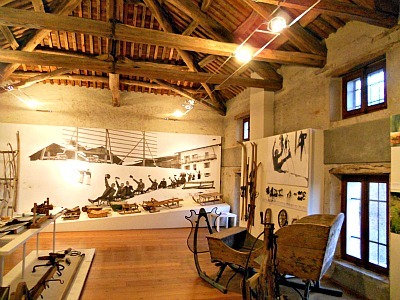 The image below depicts instead the section of the museum dedicated to the relationship man/mountains and the means of transportation in the snow, which is hosted in the atmospheric loft. Outside, on the panoramic terrace which opens up on the Val Belluna, a small French-style "roseraie" (Rose Garden) displays a collection of ancient rose cultivars, painstakingly 'rescued' from gardens within the province (see image below), while in the grounds a small orchard gathers many traditional varieties of 'forgotten' fruit trees (also known as "ancient cultivars"), now perfectly balancing the information gathered on the same subject inside the museum. The countryside around Cesiomaggiore is possibly the best-looking section of the Val Belluna, where to admire the ways in which traditional culture and economy have shaped the character of the land over the centuries – something less easily detectable in other more industrialized parts of the valley. Just outside Cesiomaggiore (to the north) is the entrance to the solitary Val Canzoi, one of the main gateways to the Dolomiti Bellunesi National Park. This valley is important as some aspects related to the historical relationship between man and this harsh mountain environment can be found there; most notably, the presence of lime kilns. In some of the small hamlets, dotted along the valley, examples of traditional architecture can be admired too. The upper part of Val Canzoi is occupied by a vast, artificial basin ('Lago della Stua'), which is the starting point of many paths that climb in altitude towards Monte Pizzocco (2,176 m: see below). The area is also crossed by the “Alta Via” ('Alpine Highway') No. 2 – a high altitude trail that, in this section, takes one first to Rifugio Boz (1,718 m) and then on to Casera Erera (1,706 m), which is the access point to the magnificent plateau of the "Piani Eterni" (the 'Eternal Plains') – one of the most enchanting and wildest parts of the Dolomiti Bellunesi National Park. Monte Pizzocco (see below) is an isolated peak whose near-vertical ramparts evoke a similarity to the Matterhorn, and its distinctive shape makes it an unmistakable sight when travelling along the Val Belluna. For its peculiar appearance, it is also traditionally considered, in many respects, a "sacred mountain". The subgroups of Cimònega and Agnelezze are more similar to proper Dolomites in their appearance; their highest peak is the Sass de Mura (2,550 m). The main gateway to these mountains is also the upper Val Canzoi, and from there you can reach the high-altitude plateau of Erera-Brendol, and again the "Piani Eterni", in the easternmost section of the Vette Feltrine. 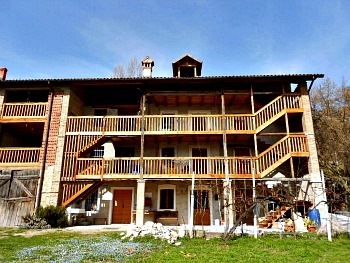 In the upper reaches of the Val Canzoi the park owns a facility too: the “Casa al Fràssen” ('Ash House', in the local patois), a beautifully restored old traditional stone building which can be rented for self-catering by groups, and that serves as an ideal base to explore the territory of the eastern Vette Feltrine. An unusual, isolated peak, the Pizzocco (from the German ‘Piz Hoc’, 'high mountain'), thanks to its position in relation to the surrounding peaks of the Vette Feltrine, is like an extraordinary balcony open on the Val Belluna below, with the backdrop of the Dolomites behind. From there, on exceptionally clear days one can see as far as the Venetian Plain and the lagoon: this peculiarity was immediately noticed by the Austrians, who used the mountain right from the start as a military outpost. The agile needle of this ‘Small Cervino’ – as it is called locally (the Italian name for the Matterhorn) – is clearly connected with its structural arrangement. The Pizzocco is in fact an actual intrusion of Main Dolomite rock pushed upwards in Geologic times along two inverted faults – the first recognizable at the basis of the eastern and western walls, while the second is an over-thrust identifiable in the rock-canal (or scree; 'canalone' in Italian) that separates it from the Valscura summit. The peculiar position of the rock layers is a determinant in the genesis of the landscape of the entire Pizzocco-Tre Pietre group; its southern side coincides with a structural slope, molded in the higher part of the Calcari Grigi (Grey Limestone). In the middle of the slope, the thin but strong horizon of the Upper Rosso Ammonitico (‘Ammonite Red’) marks the fine ridge that develops between Cima Le Laste and San Agapito, then rises to the Palmar summit – only to descend to La Perina and finally mount again on the opposite side of the Val Scura up to Casera Ere (Costa Felina); lower down, the steep slopes of the Palmar and Piz are modeled in the Biancone – a layered white limestone (hence the name; 'bianco': white), very common in the Pre-Alpine sector. There are also deposits left by running water (big boulders in the Veses stream bed) and a rocky hillside molded in correspondence with a particularly solid and compact bedrock, on the outcrop over which St. Maur’s hermitage (Eremo di San Mauro) is perched. Within this group, one can also find karstic phenomena such as crevasses, wells and springs. The Valscura is another ‘scarp valley’ (‘valle di scarpata’ in Italian), enclosed between high calcareous or Dolomite rock walls and confined in wild, craggy environments, with a very steep valley-head incised along the southern slope of the Dolomiti Bellunesi. The little country lanes that enter the valley and also the steep paths that climb it (to Passo Forca and the small Church of St. Maur, for example) cross a succession of noteworthy habitats, correlated to various altitudinal bands. Anyone visiting the valley goes in fact – and in rapid sequence – from the rural, undulated landscapes of the sub-montane belt (with habitats that are only partially wooded and small rural hamlets such as Campel, Roncoi, San Vittor Veses) to the wild and craggy environments of the lower and medium Valscura, dominated by broadleaved woodland (hornbeam, beech), fresher woodland patches (with lime, maple and ash) and other wooded slopes, to reach eventually the high altitude habitats dominated by arid fields, thickets of Dwarf mountain pine (Pinus mugo) and overhanging Dolomite crags. Beyond Passo Forca one enters a whole different world altogether – a rocky wasteland tormented by furrows and geologic rifts: these are the solitary karstic plateaus of Erera and Piani Eterni, jewels of the Dolomiti Bellunesi National Park.